At least seven Turkish soldiers were killed and 25 others were wounded after an ammunition explosion in southeastern Turkey's Hakkari province, President Recep Tayyip Erdoğan said Saturday. Erdoğan previously announced the casualty toll as four killed and 20 injured at a commemoration ceremony in capital Ankara to mark the 80th death anniversary of the Republic's founder Mustafa Kemal Atatürk. He later updated the casualty toll at a press conference held before the president's travel to Paris to attend the ceremonies marking the 100th anniversary of the end of World War I. An earlier statement released by the Defense Ministry said Friday that at least 25 Turkish soldiers were wounded and seven more are missing after an accidental explosion of defective ammunition at a base in the Şemdinli district near the border with Iran. A statement based on initial information said the explosion occurred during artillery shooting at Süngü Tepe Base. Defense Minister Hulusi Akar visited the site later on Friday, accompanied by Turkish Chief of General Staff Yaşar Güler and the commander of Turkish Land Forces Ümit Dündar. 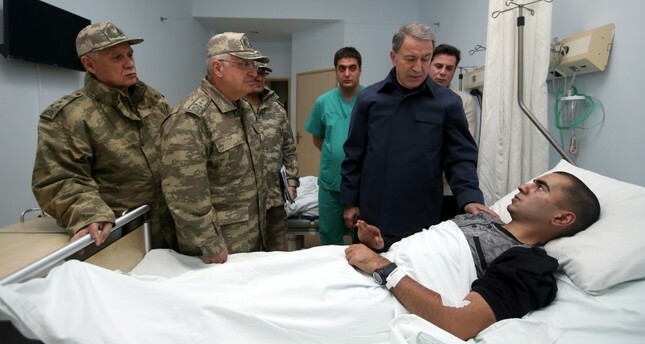 Akar also visited the soldiers at Hakkari State Hospital. "Our search and rescue works continue in the same way," Akar said.